← Solid reasons to oppose Dakar happening in Bolivia, NO more! La Paz (AFP) – A pregnant woman has been diagnosed with Zika in Bolivia, authorities said Tuesday, the first time the mosquito-borne virus, which has been linked to birth defects, has been transmitted here. Health officials in the South American country had previously detected three people who arrived from other countries with the disease, but the woman — who is eight weeks pregnant — is the first person to be infected in Bolivia, they said. “She has not traveled outside the country. This is a home-grown case,” said Joaquin Monasterio, director of health services for the eastern department of Santa Cruz. It is impossible to determine whether the woman’s baby will suffer from brain damage, officials said. Several pregnant women infected with Zika in Brazil have given birth to babies who suffered from microcephaly, a rare condition in which the brain and skull are abnormally small. A woman in Hawaii who had recently returned from Brazil with Zika also gave birth to a baby with brain damage, the US Centers for Disease Control and Prevention confirmed. But the World Health Organization said Tuesday it did not yet have conclusive evidence that Zika causes microcephaly. 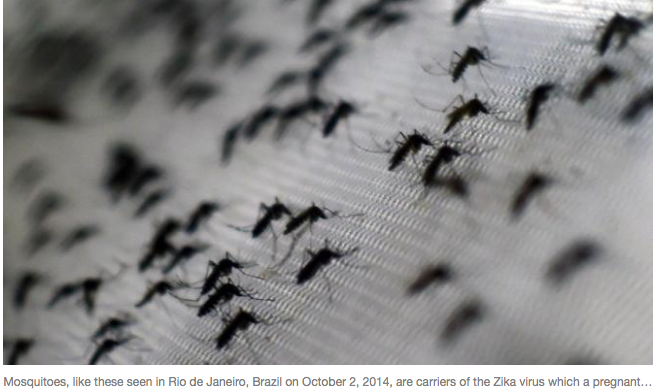 Zika, which is similar to dengue fever, has been spreading across Latin America. It had been detected in 10 countries in the region prior to the Bolivian case, according to the Pan American Health Organization. The virus can cause fever, rash, joint pain and conjunctivitis, with symptoms usually lasting less than a week. This entry was posted in Bolivia, Environment, Health, Social Unrest and tagged mosquito aides aegypti, public policy failures, Zika. Bookmark the permalink.